Metropolitan Lounge is Now Open – Opening Special! The modern, functional and adaptable new 180 sqm Metropolitan Lounge upstairs from the Deluxe Cinema is perfect for meetings and conferences up to 200 guests. With its extensive west-facing deck and elaborate private staircase it is The Tannery’s most flexible event space, available all day. The in-built state-of-the-art AV system and automated blinds allow for plug-and-play entertainment and presentations. Large panoramic windows facing the Port Hills and skylights lend gallery light to any event. 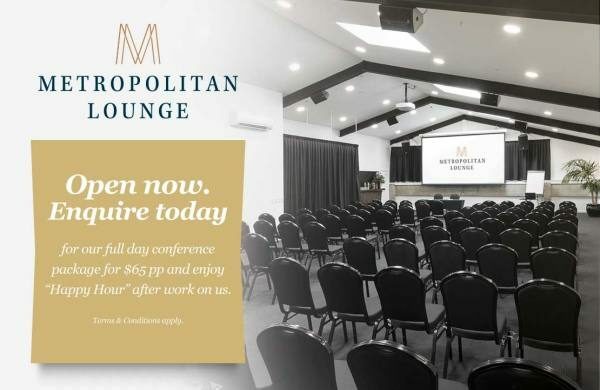 Cassels & Sons’ Metropolitan conference package is $65 per person and includes venue hire plus the use of AV & sound system, welcome coffee, morning & afternoon tea plus a business lunch.